Arrow QVM Equity Factor ETF may not be suitable for all investors. The fund may not replicate the exact performance of the benchmark because of fees, expenses, trading costs and portfolio tracking error. Exchange traded products are bought and sold at market price, not NAV, and are not individually redeemed from the fund. Buying and selling shares generally results in brokerage commissions which will reduce returns. The market price may be higher (premium) or lower (discount) than the Net Asset Value (NAV). The fund’s portfolio may underperform the general equity markets, or other asset classes, with the potential for greater individual security risk, asset class risk, and higher industry concentration risk than more broadly diversified portfolios. The fund may invest in large-cap, mid-cap, and small-cap securities. Investing in small-cap and mid-cap securities may have special risks, including wider variations in earnings and business prospects than larger, more established companies. Seeks investment results that correspond generally to the performance of the A.I. Quality Value Momentum Index (AIQVM), before fees and expenses. The AIQVM Index is based on the analysis and expertise of Ford Equity Research, long time leaders in factor-based investment strategies. 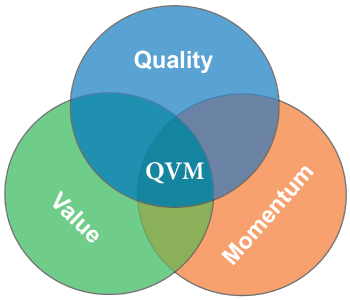 As the name implies, the QVM strategy relies on a Tri-Factor approach of stock selection through a combination of quality, value, and momentum. The use of quality metrics attempts to provide defensive characteristics to the portfolio by reducing historical volatility and mitigating losses during market declines. Value and momentum factors have been known to complement one another. By including a mix of stocks that are relatively undervalued and stocks whose prices are exhibiting long term momentum, the QVM strategy takes a diversified approach for seeking equity gains during market advances. The AIQVM Index consists of 50 equally weighted domestic equities selected semiannually and rebalanced quarterly. The index constituents are selected from approximately 3,500 companies within the Ford Equity Research universe of stocks that meet minimum liquidity and price standards—three month average daily dollar volume above $1 million and a minimum price of $5 per share. QVM model inputs are combined to create a ranking score for the stocks that meet the liquidity and price standard. The top 50 stocks based on this ranking are selected as portfolio constituents at the end of January and July, and rebalanced quarterly to maintain equal weighting. Quality factor scores are based on earnings variability, return on equity, and return of earnings to shareholders in the form of dividends or share buybacks. Value factor scores are determined by a modified earnings-to-price ratio in which the operating earnings are adjusted to account for unusual and non-recurring items. Momentum factor scores are based on selecting stocks that are exhibiting price momentum as an indication of market confirmation of long term relative performance. ²SEC Yield and Distribution Rate calculations are based on most recent Ex-Date. Distribution Rate reflects the total distributions over the previous 12 months. SEC Yield and Distribution Rate may include income, dividends, return of capital, or other distributions that are not considered short-term or long-term capital gains. Return of capital is considered a return of the investment principal and is not derived from net profits. ³Total operating expenses are capped at 0.65% by a contractual waiver effective through 5/31/2019, subject to cap removal by Board approval upon 60 days notice. Before the fee waiver of -1.86%, expenses would include the 0.60% management fee and 1.91% other expenses, for a total expense of 2.51%. ²Reflects partial calendar year 2/27/2015-12/31/2015.